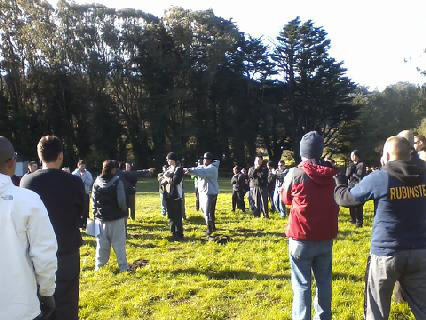 I recently visited the ropes course run by The Wilderness Program on San Bruno Mountain in Daly City, a beautiful park setting. PVF has been a supporter of the Wilderness Program for some time. Years ago we helped to fund the building of the ropes course that is now utilized by so many. The program engages youth on the verge of dropping out of school from the Jefferson Union High School District in a positive, hands-on activity. This day, however, it was not high school students participating, but rather 50 cadets from the San Francisco Police Department. These cadets, who ranged from ages 20 to 40, were chosen from more than 7,000 applicants to join the SFPD. Their experience at the ropes course was part of their training, meant to build trust and teach them how to work together. This was done through teambuilding exercises such as trust falls, in which people take turns fall backwards and have to trust the other group members to catch them. Another exercise involved the cadets holding hands in a circle and working together to transform their circle into a star – all while blindfolded! Assisting the cadets were the youth from Jefferson High School District that typically are participants. This day they worked as trainers, which imbued within them a sense of responsibility as they guided the cadets through the ropes course. The collaboration between the youth and police cadets was exciting to watch as they came together to work through challenges and gain mutual respect and understanding. This entry was posted in Uncategorized and tagged Daly City, trust, Where's Bill, youth. Bookmark the permalink.